Thula Thula Lodge - Kameeldrift East Accommodation. 5/17 - UNIT NO: 4 - Half Room with bunkbed. I would like to introduce you to Thula Thula Lodge, Pretoria, Gauteng. The Lodge offers sumptuous home-from-home accommodation. Unique haven only half an hour's drive outside Pretoria. This peaceful, retreat is ideal for affordable self catering accommodation, business accommodation, conference facilities, or a weekend retreat in a bushveld atmosphere that gives you time away from everything. Thula Thula Lodge offers a complete outdoor experience. Yes, it's possible to experience the peace of nature even while being in close proximity to countless other enriching activities in the Dinokeng Conservancy. These include the nearby Cullinan Diamond Mine, Mooi Poort Golf Course and Roodeplaat dam, which is a splendid venue for fishing, canoeing. Because of its setting and outstanding function facilities, Thula Thula Lodge is also an exceptional wedding venue. 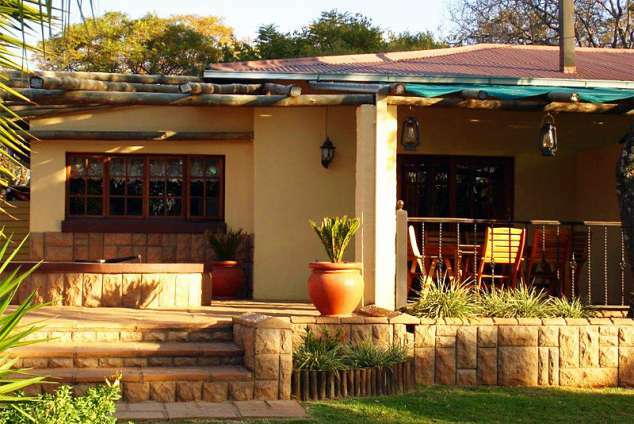 Thula Thula Lodge is in the north-eastern quadrant of Gauteng and is easily reached from Johannesburg (a mere 45 minutes) or Tshwane on the N1 or the N4. Should it be necessary, excellent roads will easily transport you to malls (including all the major stores), cinemas only 10Km away, and 50km away a casino. Fully furnished one bedroom unit (3 x single beds in room). Fully equipped kitchenette, fridge, microwave, kettle, two plate stove and cutlery. Living area with DSTV Hotel Package. Veranda with table & chairs, and free standing braai. Under shade parking for one car. Need to bring own food, toiletries, mosquito repellent, swimming towels. NO SERVICES OF UNITS & RONDAWELS OVER WEEKENDS OR LONG WEEKENDS. Fully furnished one bedroom unit (2 x twin beds in room). Fully equipped kitchenette, bar fridge, microwave, kettle, two plate stove and cutlery. Need to bring own food, toiletries, mosquito repellent and swimming towels. Fully equipped kitchenette, bar fridge, microwave, kettle, two plate stove and cutlery in living area. Veranda including braai with table & chairs. Veranda including braai with table and chairs. Fully furnished two bedroom unit. (2 x twin beds in each room). (Sleeper couch in living area - can sleep extra 2 people). Living area with DSTV Hotel Package, fireplace and bar counter. Veranda with boma and braai facilities. Take the Zambesi Drive/Cullinan offramp. Proceed straight over two robots. At the 4-way stop turn left. Directly after the nursery on right hand side. Thula Thula Lodge on right hand side number 296. 39602 page views since 31 Jul, 2006.